Make Calabogie Peaks your hub for a ride through the magnificent Ottawa Valley and beyond; along paved roads that follow sparkling rivers and lakes, and that meander town to town. Some roads are made for motorcycles and there are none better than those winding through the heart of the Ontario Highlands. The Toronto Star writes about riding the Highlands. 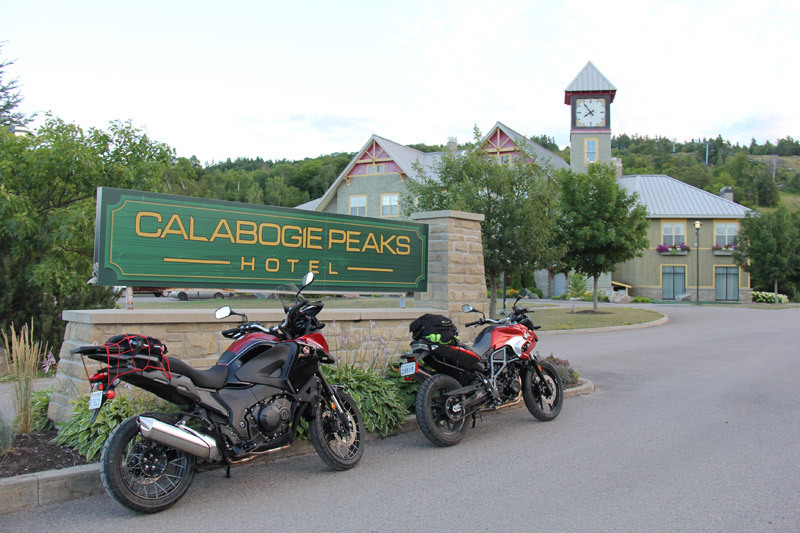 Calabogie Peaks is featured along the Highlands Loop, a route mapped by Ride the Highlands taking you alongside the Ottawa and Rideau Rivers, through Algonquin Park, and the towns of Calabogie and Tweed. An historic route to Canada’s capitol Lunch at Average Joe’s Restaurant in North Bay, Ontario was anything but average. From here, we would ride to Ottawa, following the route fur-traders and explorers used four-hundred years ago, well before any Europeans settlements existed in this “new” land. The vista from the lakeside patio called to mind images of how this land must have appeared in those times and the resilient characters who tried to tame it. We too were on an adventure and following the same route, albeit our adventure was of a very different nature.